Additional information provided by Henry Olden Jr. (son) a retired American Airlines pilot and Jim Olden (grandson) United States Air Force below. Updated Jan 2013. Long before the New Bedford Municipal Airport, Fairhaven was the (Southeastern MA) main hub for airplane traffic along side Col. Green's Round Hill Airport in Dartmouth Mass. Sound Airways, Inc. provided a valuable service from the mainland to the islands of Martha's Vineyard and Nantucket for passengers and freight. 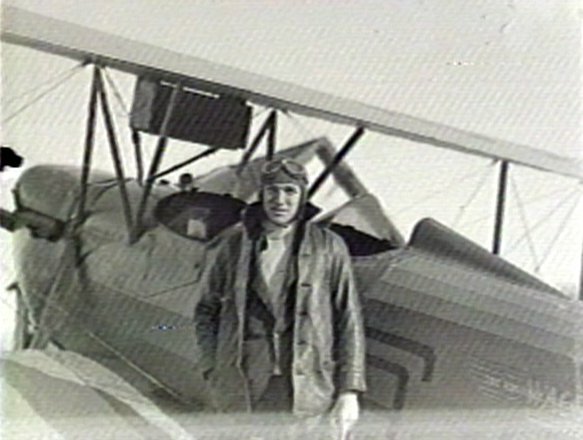 The small airline company was owned by Ike Dawson, of The Dawson Brewery fame, and operated by Fairhaven resident and pilot, the late, Henry Olden. His name was synonymous with New Bedford, Fairhaven, Acushnet Airport as it was officially called at one time. 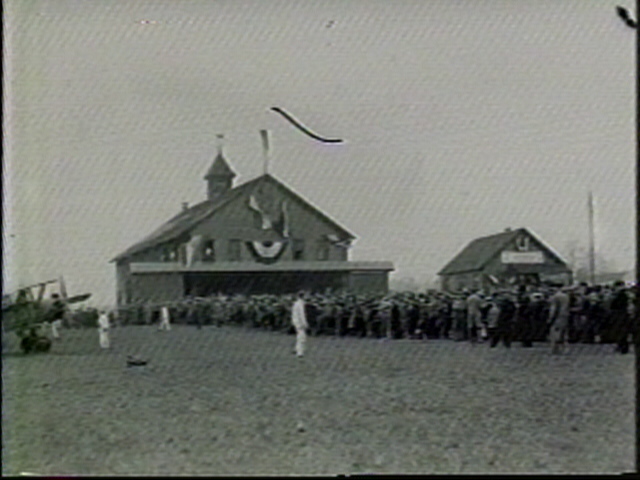 The airport was once located off Pontiac St. in Acushnet, but the pilots had difficulty with its small muddy fields. It was eventually relocated to a large, more stable field along the west side of Mill Rd. and the north side of Route 6, where Titleist stands today. The 85+ acre parcel was sold by Watson Jenney to John Duff of The David Duff & Son Coal Company in 1901. The Duffs used the land and barn for their company horses that were used to haul coal deliveries by wagon. The property was also used as a grazing field. In 1929, Sound Airways (named after the island sounds of Martha's Vineyard, Nantucket and Long Island) purchased the property. In less than 3 years, financial troubles brought about by the depression brought the field to an almost idle standstill. Although still used as an airfield,it never again had the splendor and excitement that came with Sound Airways and the flight training school. Henry Olden continued his career in military and commercial aviation until he retired. His son and grandson continue the legacy of the "Flying Oldens". The late John "Ace" Roderiques once recalled to me, that as a youngster he stumbled on to the scene of a plane that crashed on take- off and ended up off New Boston Road. The wreckage was strewn with broken bottles of "hooch" and jugs of whiskey he said. 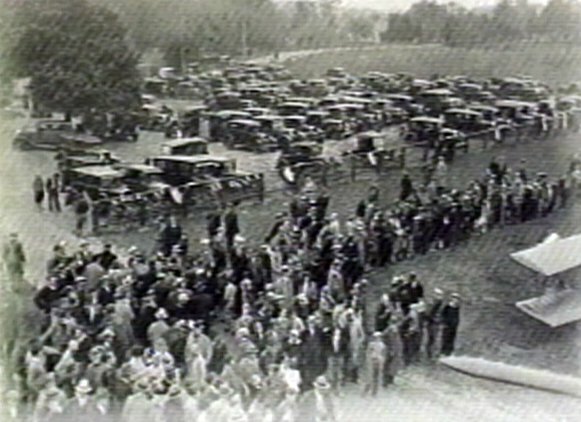 Over 25,000 attended the 1930 Air Show. More than three dozen aircraft were on display at Baylie?s Field. Ford Tri-Motors like these (below) became the workhorse for the fledgling airline industry. Transcontinental flight was taking shape. One could now carry a meal on board, along with a new perk, an airline stewardess. This picture (above) was taken looking towards the southwest from Mill Rd. Note the white house in the upper left side, that is now CareFree Homes on Huttleston Avenue. Also present in the photo are a Travel Air R, Mystery Ship, a few Fleets, and a Kinner Bird. The Ford Tri-Motor on display at Baylies Field. 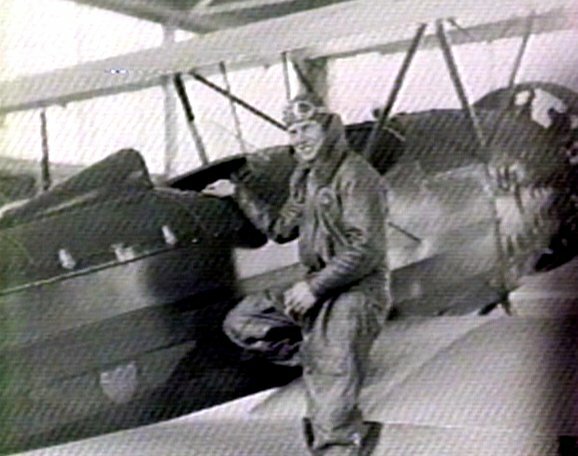 This pilot stands by his 2 seat bi-plane nicknamed "Hap Hazard". Note his co-pilot's name painted on the side captioned "Mary Hart, Co-Pilot". Melissa Hart, Author and Journalism Professor at The University of Oregon, is the great grand-daughter of Harold and Mary Hart. She contributed this fascinating story about this "dynamic duo of the air". Hap Hazard's real name was Harold Hart, and his wife's name was Mary Hart. He died in a plane accident in 1974 in Salinas, CA--there's a family rumor that he pushed his home built plane to do barrel rolls, knowing it couldn't withstand the strain, but of course, that's not confirmed. My great-grandmother died ten years ago--I lived next to her for several years, and she told me all about their stage career. I've got hundreds of clippings and photos from their aviation/circus/vaudeville days. Women played a significant role in the early days of flight. 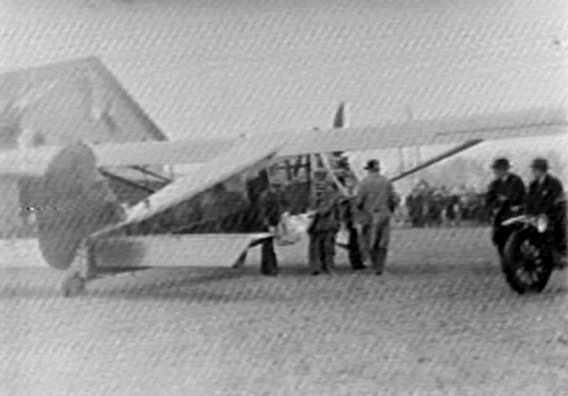 Amelia Earhart would soon be the first woman to fly across the Atlantic from Newfoundland to Londonderry England just 2 years after this photo. 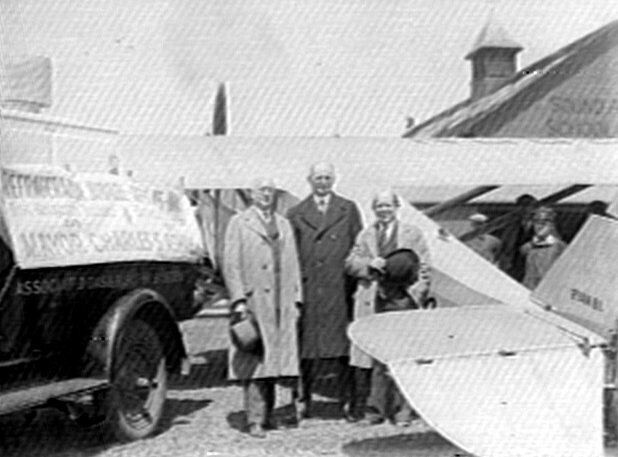 Henry T. Olden (above left) of Fairhaven Sound Airways. SIT IN THE COCKPIT OF A WACO CLASSIC ENTER ABOVE! A co-pilot cramped into his seat. Note the haircut, now back in style. This postal commemorative, marked December 22, 1929, 330 PM, Dedication and Air Races, Sound Airways, Inc and insignia of Fairhaven Post 166 of The American Legion. The envelope was addressed to, Mr. Frank Dunn, 77 Main St, Fairhaven, Mass. And signed by the Postmaster. 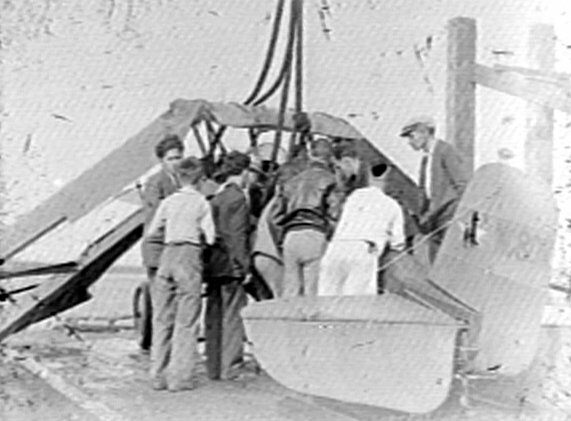 Workers unload the first refrigerator delivered by air to the area. New Bedford Mayor Charles S. Ashley was the recipient. 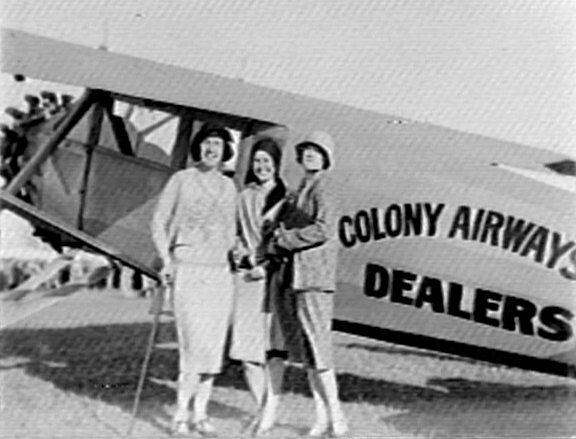 Note: The plane was from Colony Airways Company. Mayor Ashley, with his trademark cigar in hand, offers a hearty hand shake to a pilot at the airport. Ashley was one of New Bedford's most popular and eccentric politicians at the time. but crashed in the Acushnet River. According to some reports, the young pilot (about 18) apparently suffered some kind of seizure. Oh, the stories this pilot could tell. The propeller, a simple, but carefully tapered piece of wood, soon changed the world forever. Thirty nine years after this picture was taken,man landed on the moon. This happy couple just got off the plane in the background. 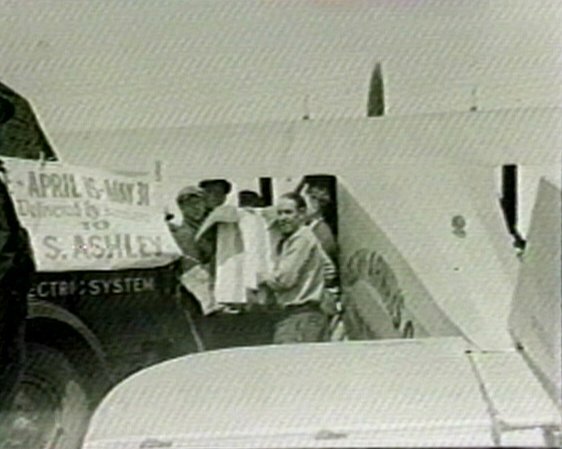 The bespectacled lad proposed to the young woman while in flight over Fairhaven. The weather was just too unsettled, cloudy and drizzly, so they decided not to fly a second time. Sound Airways Company Plane a Travel Air S-6000, NC8193. Now that's a tail wheel! Is this the co pilot's nickname? "SKID DOO" painted on the side of this classic Waco model. This old photo (above) remained unidentified for decades. No one knew what is was or were it came from. Just an old areal photo. So I started comparing areals I have on file and found a match! The road layout is the same from the 1994 picture taken over Mill Rd and Bridge St (below) looking southwest , as is from an airplane photo over Fairhaven Airport around 1929. 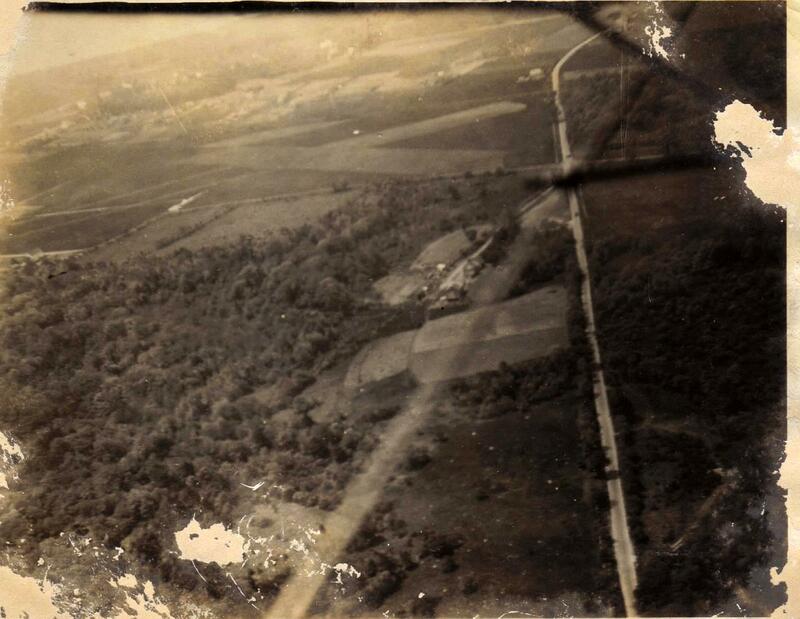 This is perhaps the oldest known areal photo over Fairhaven. The runway is clearly visible where Titleist now stands today. Click on photos to enlarge. The annual air shows were as popular as the Homecoming Day Fair of today. The airport struggled through the early thirties with Depression related financial problems. The need for a larger, modern airport brought about its demise with the construction by EPA workers of New Bedford Municipal Airport. In the mid 1940's, Bailey's Field* was sold to a farm dairy . The once familiar sights and sounds of aircraft were replaced with grazing cows of The Cedar Ledge Farms (of the Goulet Family),in the early 1940's ending a fascinating chapter in Fairhaven history. The barn was destroyed by fire in 1953. The story of Fairhaven Airport in it's hey day, along with many planes displayed at the Airshow in 1930 is featured on the West Island Weather Station web site. "I just wanted to thank-you for a delightful surprise this morning-I looked for my great grandfather "Hap Hazard" on Google and found a photo of him that I've never seen before with the Fairhaven Airport story on your web site" Melissa stated in a recent email. Ms. Hart, who's an Author and Journalism teacher at The University of Oregon is compiling a book on the aviation/circus and vaudeville days of her great grandfather "Hap Hazard" and his wife and co-pilot Mary Hart. "They flew from theater to theater along with fairs and other events in the 1920's and 30's." she said. Sadly, Harold "Hap Hazard" Hart died in a plane crash in 1974 in Salinas, California. He apparently pushed his home built plane too far doing some barrel rolls and crashed. Melissa Hart's book is sure to be a fascinating look back at the early days of aviation, especially with this unusual husband and wife team of aeronautical entertainers. I came across your website on Sound Airways and am wondering if you might be able to provide me with the N# on the tail of the aircraft in the two attached photos from your website. I can't quite make them out as they appear, but thought that your originals might show them up a bit better.. I recently acquired a hand-colorized photo of this same aircraft and will be using it as the "inside cover" of an e-magazine that i edit called "Skyways - The Journal of the Airplane 1920-1940." I'd also like to include a link to your site if that would be okay so I readers can learn more about Sound airways from your information directly. After the publication is released, I'll be happy to share the image with you if you would like to include it on your site. The tail number is NC8193. "Thank you again for letting us use the info. I was really happy to be able to ID the photo I had thanks to your site. Now that's a tail wheel! It's funny...you can even read HT Olden's name on the side of the fuselage, yet I had no idea who he was or that it was him in the photo, and I didn't know what the H or T stood for." 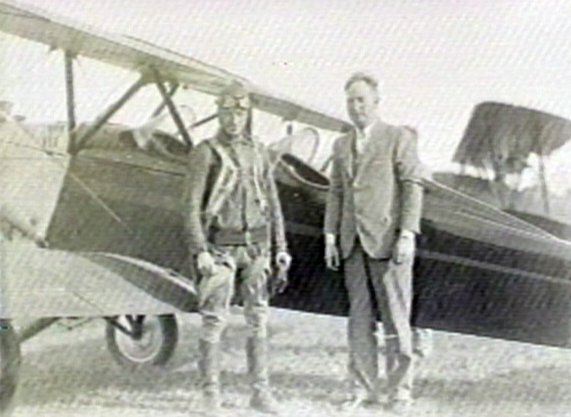 From the grassy fields of Fairhaven Airport in 1930, Henry Olden took into the air many a time as founder and chief pilot of Sound Airways. His son, Henry Olden Jr. became a pilot in his earlier days, being taken under the wing of his father who introduced him to Dave Frawley of Mattapoisett who had been trained by Olden Sr.
Frawley would later become a legendary pilot and trainer himself who's expertise was flying the B-17 Flying Fortress (above) in WW II. Henry Olden Jr. sent us a detailed biography as a career pilot and wanted to share his past experiences flying all kinds of commercial and military aircraft before his retirement from American Airlines in 2003. I was born in 1944 in New Bedford Massachusetts, at St. Luke's Hospital. I started flying as a passenger early on with my father, Henry Olden Sr., when you could still ride in the cockpit as a passenger. I primarily flew on the Douglas DC-3 and DC-6B, and the Convair 580 (photos above). In 1960 I began flying lessons when my father contacted his former student, Dave Frawley of Mattapoisett, who agreed to teach me. I soloed in February 1961, at New Bedford Airport in a Cessna 172 (below) with Mass Air Industries. I continued flying lessons, flying locally until departing for college in 1962. I went to Saint Anselm College in Manchester, New Hampshire, where I continued flying. I took my private pilot exam at Concord Municipal Airport and flew privately until 1966. In the summer of 1966 I went to Air Force Officer Training School (OTS), a twelve week course at Lackland Air Force Base, Texas. Following OTS I received an assignment to Undergraduate Pilot Training at Craig Air Force Base in Selma, Alabama. I graduated in the fall of 1967, receiving an assignment to Strategic Air Command (SAC) in the Boeing KC-135 Stratotanker (below) as a co-pilot. I went to Castle Air Force Base in Merced, California, and finished in the spring of 1968 with an assignment to the 913th Air Refueling Squadron at Barksdale Air Force Base in Shreveport, Louisiana. The KC-135A was known as the "water wagon" due to 670 gallons of water held in a keel beam tank, which was injected into the engines on takeoff for added thrust. The crew included a navigator and boom operator. We sat alert at Barksdale and at Goose Bay Labrador for one week at a time. The B-52s (above) would fly their missions, and we would offload 106,000 pounds of fuel en route. After eighteen months at Barksdale, I wanted more flying activity so I volunteered to fly the Fairchild C-123K Provider (below) overseas. I attended training for the C-123 at Lockbourne Air Force Base in Columbus, Ohio. Following training, I got an assignment to the 606th Special Operations Squadron "Candlesticks" in Nakhon Phanom, Thailand, where I served from November 1969 until November 1970. I flew nighttime missions as a forward air controller (FAC) over Laos. I returned to SAC in the KC-135 at K.I. Sawyer Air Force Base, Michigan. I was so fired up about the airlines that I had put in a date of separation and left the Air Force in December, 1971, but continued in the Air Force Reserve at Hanscom Field in Bedford, Massachusetts, flying the C-123 for a short time. Meanwhile, I had gotten my ATP (Airline Transport Pilot rating), instrument, and multi-engine Instructor ratings at Van Dusen in Minneapolis. After leaving the Air Force, I also wanted to improve my background by getting a flight engineer rating, which I did on the Boeing 727 with Northeast/Delta Airlines (Northeast merged with Delta on August 1, 1972 - photo below) in Boston. I got my rating on my second try, shooting night instrument approaches into Portland International Airport. With these ratings and the help of Mr. Bill Lafferty, a former flight student of my father and chief pilot at Fram Oil Corporation, I managed to get a job at Fram as a copilot on the Convair 580. I flew the Convair out of the New Bedford airport for fourteen months, after which I got a job with American Airlines in 1972. I started as a flight engineer based at LaGuardia Airport in New York City. I transferred to Boston, also on the 727, but within the one-year probationary period, the 1973 fuel crisis resulted in a furlough..During the furlough, I met Ms. Maureen O?Brien an American Airlines flight attendant from Cleveland, Ohio. She was not furloughed, but relocated from Boston to Chicago. Also during the furlough, the airline referred me to the DABS project (Discrete Address Beacon System), the beginning of the collision avoidance research program at the MIT Lincoln Laboratory. avoidance research program at MIT?s Lincoln Laboratory. In the summer of 1966 I went to Air Force Officer Training School (OTS), a twelve week course at Lackland Air Force Base, Texas. Following OTS I received an assignment to Undergraduate Pilot Training at Craig Air Force Base in Selma, Alabama. I graduated in the fall of 1967, receiving an assignment to Strategic Air Command (SAC) in the Boeing KC-135 Stratotanker as a co-pilot. I went to Castle Air Force Base in Merced, California, and finished in the spring of 1968 with an assignment to the 913th Air Refueling Squadron at Barksdale Air Force Base in Shreveport, Louisiana. The KC-135A was known as the ?water wagon? due to 670 gallons of water held in a keel beam tank, which was injected into the engines on takeoff for added thrust. The crew included a navigator and boom operator. We sat alert at Barksdale and at Goose Bay Labrador for one week at a time. The B-52s would fly their missions, and we would offload 106,000 pounds of fuel en route. After eighteen months at Barksdale, I wanted more flying activity so I volunteered to fly the Fairchild C-123K Provider overseas. I attended training for the C-123 at Lockbourne Air Force Base in Columbus, Ohio. Following training, I got an assignment to the 606th Special Operations Squadron ?Candlesticks? in Nakhon Phanom, Thailand, where I served from November 1969 until November 1970. I flew nighttime missions as a forward air controller (FAC) over Laos. I returned to SAC in the KC-135 at K.I. Sawyer Air Force Base, Michigan. I was so fired up about the airlines that I had put in a date of separation and left the Air Force in December, 1971, but continued in the Air Force Reserve at Hanscom Field in Bedford, Massachusetts, flying the C-123 for a short time. I was born in 1944 in New Bedford Massachusetts, at St. Luke?s Hospital. I started flying as a passenger early on with my father, Henry Olden Sr., when you could still ride in the cockpit as a passenger. I primarily flew on the Douglas DC-3 and DC-6B, and the Convair 580. In 1960 I began flying lessons when my father contacted his former student, Dave Frawley of Mattapoisett, who agreed to teach me. I soloed in February, 1961, at New Bedford Airport in a Cessna 172 with Mass Air Industries. I continued flying lessons, flying locally until departing for college in 1962. I went to Saint Anselm College in Manchester, New Hampshire, where I continued flying. I took my private pilot exam at Concord Municipal Airport and flew privately until 1966.
avoidance research program at MIT?s Lincoln Laboratory. The lab was doing software and hardware analysis and building of the equipment, and hired me as a consultant flying the Beechcraft Debonair, Piper Cherokee Six, and Piper Navajo Chieftain. The salary was good from MIT, and I met a lot of FAA engineers and employees from the Mitre Corp in Virginia. Flying for the labs lasted for two years, during which Maureen and I decided to marry. We rented a house on Cannon Street in Mattapoisett, MA. to check out in the Boeing 777 in 1999. I accumulated about 1,500 hours in the 777, flying to Tokyo and London. In 1998 we decided to move to Cleveland, making the commute to Chicago?s O?Hare International Airport easier. The events of September 11, 2001, brought on many changes including financial problems for the airline industry. They were developing new pay scales for pilots, and I began thinking about retiring as airline bankruptcy fears began threatening benefits. I retired from American September, 2003. Municipal Airport and flew privately until 1966.
in the Air Force Reserve at Hanscom Field in Bedford, Massachusetts, flying the C-123 for a short time. The lab was doing software and hardware analysis and building of the equipment, and hired me as a consultant flying the Beechcraft Debonair, Piper Cherokee Six, and Piper Navajo Chieftain. The salary was good from MIT, and I met a lot of FAA engineers and employees from the Mitre Corp in Virginia. Flying for the labs lasted for two years, during which Maureen and I decided to marry. We rented a house on Cannon Street in Mattapoisett, MA. Back with American Airlines in Boston in 1975, decided that we needed to go to Dallas. We left Crapo Street in Marion, for Denton, Texas, in 1983. I upgraded to the right seat in the 727, flying Caribbean and domestic routes. When a chance for a higher-paying job as First Officer in the DC-10 came along, I decided to go to school for a dual-qualification in the DC-10-30 (below). I flew domestic and international routes, including Honolulu, Frankfurt, and London. Then I had the chance to upgrade to the left seat on the DC-9. I checked out on left seat of the MD-80, which I enjoyed. After the passing of my parents, we decided to return to Massachusetts, where I could either hold a flying job in Boston, or commute. We came back to Fairhaven in 1989. Boston was very senior, so I commuted to LaGuardia. Then the possibility of more pay came along with the Boeing 757/767, so I decided to go for that even though I would have to continue commuting. It was a very difficult checkout. I commuted from Providence to John F. Kennedy International Airport in New York City, and flew routes to the Caribbean islands of Bermuda, Aruba, Saint Martin, and Saint Thomas, mostly on the 757. I also got cleared to fly to the east coast of South America including Rio de Janeiro, Sao Paulo, and Buenos Aires, as all of the west coast - mountain flying - was out of Miami. I also flew the North Atlantic routes to London, Paris, Brussels, and Stockholm. I didn't go on to fly the Italy route because I decided to check out in the Boeing 777 (below) in 1999. I accumulated about 1,500 hours in the 777, flying to Tokyo and London. In 1998 we decided to move to Cleveland, making the commute to Chicago's O'Hare International Airport easier. The events of September 11, 2001, brought on many changes including financial problems for the airline industry. They were developing new pay scales for pilots, and I began thinking about retiring as airline bankruptcy fears began threatening benefits. I retired from American September, 2003. Not wanting to quit flying completely, and having grown up flying smaller airplanes, I decided I wanted to have something to play with, and purchased a Cessna 182 (below) with the help of Al Beckwith at Kent State Airport. I did that for about a year and then wanted to get the Cessna 182 Turbo. About the same time I checked up on the Angel Flight program. It gave me something to do with the airplane to contribute. I volunteered to fly patients with financial need from their home towns to their place of treatment. The timing worked out perfectly and I did that for two years. I flew so much I was the angel flight pilot of the year for Ohio in 2004. I got to meet a lot of people. It was very interesting and fulfilling and the passengers and families were very appreciative. I flew primarily in the Great Lakes region, mainly to the Cleveland Clinic. One passenger came from West Texas for treatment. I picked her up in Kentucky, flying the final leg to Cleveland. I finally decided to sell the airplane in 2005, officially retiring from flying. My two sons, Ty and James, have also pursued flight. Ty soloed at sixteen and James pursued a career in the Air Force. Editor's note: Jim's boyhood home was on Phoenix Street in Fairhaven, the story below was sent in 2011. Mr. Baron, thanks for your interest - I have attached a couple of pictures of me with the Boeing C-17 (Globemaster III). I spent six years flying this aircraft - for three years flying Operation IRAQI FREEDOM (OIF) and Operation ENDURING FREEDOM (OEF) missions for Air Mobility Command (AMC) and for three years as a schoolhouse instructor for Air Education and Training Command (AETC). I was stationed at McChord AFB, WA, and Altus AFB, OK, respectively. The picture (above) was taken on 17 Feb 2005 at Pegasus Field (named after the Lockheed Constellation that crash-landed there in 1970) on the Ross Ice Shelf, Antarctica, a couple miles from McMurdo station. During Operation DEEP FREEZE, we flew missions from Christchurch, NZ, to the "ice" for the National Science Foundation. This particular mission was in support of the redeployment of personnel and equipment at the end of the summer. The cover picture (above) was taken 25 Nov 2004 in Kabul, Afghanistan. The mission originated in Frankfurt, Germany, and transitted Bagram AB, Afghanistan, Kabul, Afghanistan, and Cameri AFB, Italy, in support of the International Security Assistance Force (ISAF). Hopefully my dad can find some pictures as well - either from his Air Force days (C-123 and KC-135A) or flying for American Airlines (727, DC-9, DC-10, 757/767, 777). I'm currently "flying a desk" here in Hawaii, as a staff officer for Pacific Air Forces (PACAF). Perhaps my daughter will carry on the tradition as well - she'll be 5 next week! On a side note, my mom's father was an Army Air Corps B-17 instructor pilot at Kirtland AFB, NM, during WWII. And my father-in-law flew the UH-1 Huey and the OV-1 Mohawk in Vietnam. He is a retired Delta captain who now pilots the Augusta 109 for CareFlight in Dallas, TX. So we're no strangers to aviation! All the best to you and your family, and Fairhaven. Editor's note: And so the tradition of flight carries on through three generations of Fairhaven men., all which began here at an obscure grassy air field in Fairhaven, MA in the late 1920's.